Home > Diving Articles	> #TBT – Dive Girl; Get Off On Your Kit! #TBT – Dive Girl; Get Off On Your Kit! About a million years ago, to be precise December 1998, a new diving magazine was launched in the UK called ‘Dive Girl’. It had a short life, but it is still remembered with affection by some divers. I didn’t know it at the time, but writing an article in the debut edition would help launch my writing and PR career in scuba and technical diving. This is the first piece I wrote. I could write about any piece of diving equipment I liked. 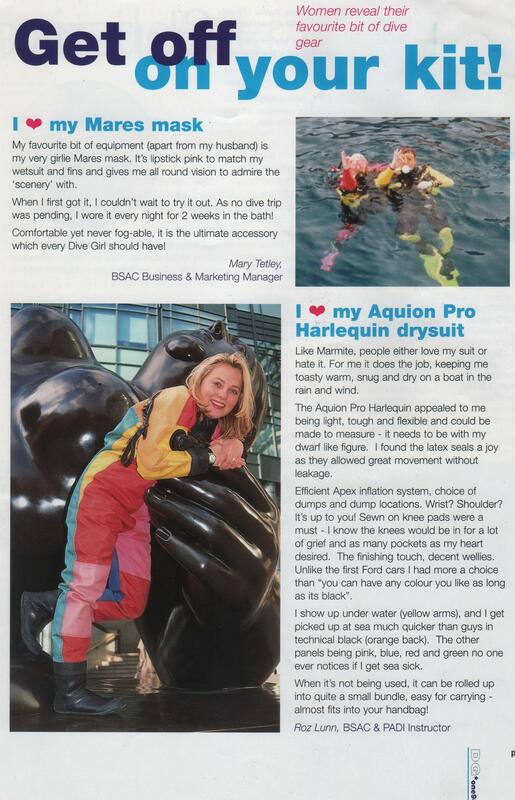 I chose my Aquion Pro Harlequin drysuit. It had taken me three years of hard saving to get this suit, and when it arrived, I was that excited, I almost slept in it on the first night. I can get very attached to my diving equipment. Whilst I don’t dive this suit any more, it still makes me smile every time I open the garage door. Sixteen years on, it is also great to see the other lady featured on this page, Mary Tetley, is likewise still involved with scuba diving too. Today Mary is the CEO of the British Sub Aqua Club. I remember this article well. In fact I too was featured in an article back then. How do a find a copy of that article I wonder. And, yes, I too had the Harlequin dry suit back then when you had yours. It was an odd suit for me to have since all the guys who were into Mixed Gas diving then were wearing BLACK suits and kit. Being a confident woman, I didn’t mind being odd. Would love to get a copy of that old article.